I thought that I would do something a little different today. Instead of sharing an article from another history or news site on my Facebook Page, I would write my own. Directories can provide very useful information for Family and Local Historians. Why Were Trade Directories Published? 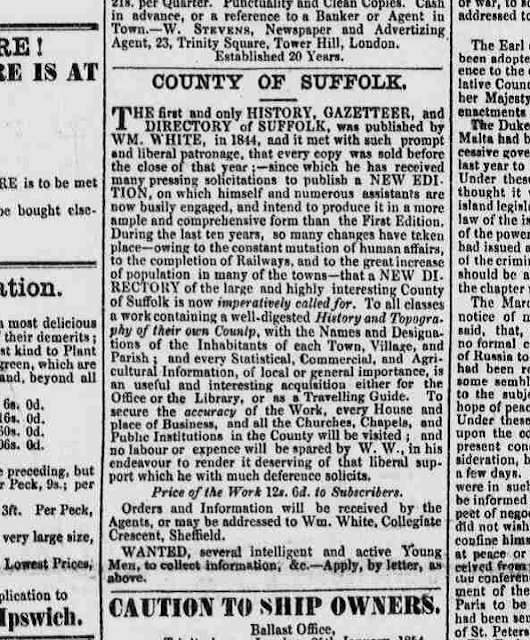 Trade Directories were first published around the beginning of the nineteenth century to provide information about towns and localities for travellers, traders and other visitors. A directory would include a general description of the town, parish or area and then include details on land ownership, buildings, churches, schools, shops, and businesses. Later they included more in-depth information on specific people, such as businessmen, traders, and shopkeepers, as well as the local gentry. Directories are great source for placing people in a particular place and time and finding out about the topography and demography of an area. They are especially useful for finding information in between census years and sometimes are available in earlier years when census information doesn’t exist. Directories can help you understand what life in that time and place might have been like. In this picture you can see the 14 parishes and extra-parochial places in Ipswich in 1855. The table shows the population of each individual parish in 1801, 1821, 1841 and 1851. It also shows the number of houses in those parishes, the territorial extent of the parishes and the rateable value (as assessed to the poor law rates in 1853). In this picture you can see the village of Stoke Ash in Suffolk and the information the directory tells you about that village. You can see that the White Horse Inn plays an important part in the community. Petty Sessions were held here once a month on Mondays and a ‘hiring for servants’ was held here in October every year. Further information includes postal information and that the church of the parish was All Saints church, also, two ancient British urns were found in the parish. The bottom section shows the notable people of the village, the traders and a separate part is devoted to the farmers of the area. Please feel free to contact me if you would like to know any more information about Directories or would like me to look up someone for you in one of my directories.